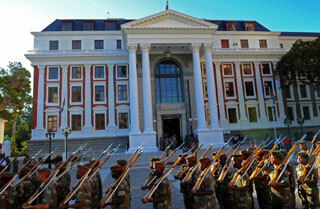 Read President Jacob Zuma’s State of the Nation speech here. President Jacob Zuma has delivered his State of the Nation (SONA) speech to Parliament, focusing very much on the past rather than the future, but raising some burning immediate issues, from the weak rand to strikes in the mining sector and violent protests. Commentators and opposition politicians said the President had not delivered on many of his promises to the nation and that his speech was thin on announcing new initiatives. Opposition political leaders said they were left wanting, especially about job creation, while economist, Chris Hart, said Zuma had failed to deal with measures to pull South Africa out of its economic malaise. This year’s SONA looked back at the past five years as well as 20 years of democracy. The President said streamlining regulatory and licensing approvals for environmental impact assessments, water licences and mining licences would make it easier to do business in the country. Hart told Moneyweb after the speech that Zuma had not focused on what the government was going to do about South Africa’s slide to becoming part of the ‘Fragile 5’ group of economies. He said South Africa now had the triple problems of strikes, a slew of regulation and a tranche of taxes which discouraged investment and job creation. Zuma raised some of the new regulations in his speech. Zuma said government, business and labour would need to work together to grow the economy at growth rates above five percent to create the number of jobs the country needs. He said Cabinet had set a target of creating 6 million work opportunities from 2014 to 2019, mainly for young people. This was in line with the Expanded Public Works Programme and the Community Work Programme. IFP leader, Mangosuthu Buthelezi, dismissed the idea after the President’s speech, saying these were not real and sustainable jobs. Zuma touched on the Employment Tax Incentive Act as a key job driver, as he said it would encourage employers to hire younger workers. He said regulations would ensure this did not jeopardize older workers. “What South Africa desperately needed to hear tonight was a bold plan to end corruption and create real, sustainable jobs in our economy. But all we got was more of the same,” said Mazibuko. The President has set a target that the state will procure at least 75% of its goods and services from South African producers. He said the government would need to work far harder to develop emerging or black industrialists. The President singled out the mining sector as critical for the economy. He said it employed half a million people, was the biggest foreign exchange earner and contributed 20 billion rand to tax coffers. He veered off his prepared speech to warn trade union leaders and mining companies against both violent strikes and retrenchments. He also warned mining companies that 2014 was the deadline for them to improve housing and living conditions. Fracking appeared to get the green light. “The development of petroleum, especially shale gas, will be a game-changer for the Karoo region and the South African economy,” Zuma told Parliament. “Having evaluated the risks and opportunities, the final regulations will be released soon and will be followed by the processing and granting of licences,” he added. The President raised plans to set up a central tender board to adjudicate tenders in all spheres of government. A chief procurement officer would work in tandem with the board. Zuma said the Anti-Corruption Hotline had led to 13,000 cases of corruption and maladministration being referred to government departments, while 1,542 officials had been dismissed from the public service. In her reaction, Mazibuko said the President had failed to announce policies ensuring tender committees were open to all members of the public and needed to tackle his own corruption scandals to earn credibility. The ongoing violent public service strikes were raised as a great concern. Following the police shootings of nine people, Zuma said police needed to act within the ambit of the law, but that ‘we should be careful not to delegitimise them and glorify anarchy in our society’. He said crime had decreased by 21% since 2002. 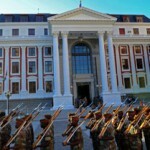 Commentators and political parties said this year’s SONA had clearly been one to reflect on 20 years of democracy and tread water in an election year. They said while South Africa was in a better place than before democracy, service delivery had lagged over the past five years in particular.